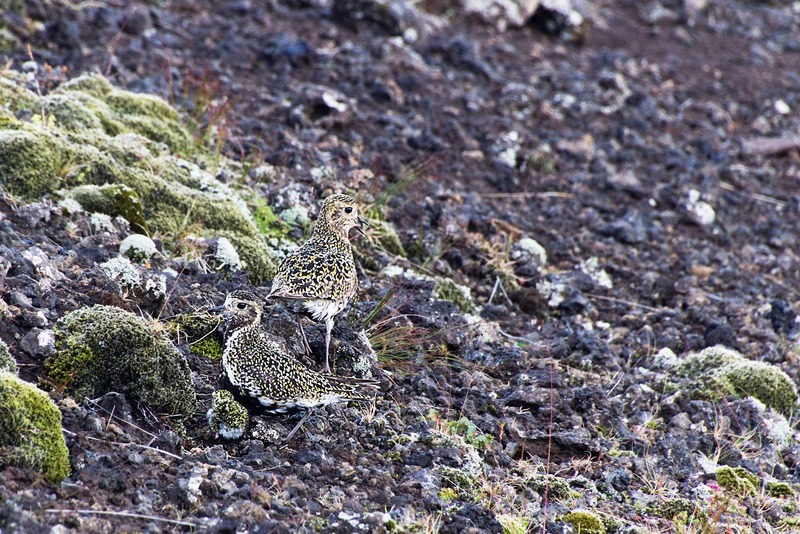 Golden Plovers - rarely meeting a bird (a family in this case) made me so joyful. The two adults were singing and getting our attention. When we seemed no harm and after quite some while they joined in the same spot and I thought for a moment, I saw this piece of moss roll around. Looking closer it was the chick they were guarding. They kept singing and looking at us. We were a mere few meters away and standing in the middle of the road - our jeep right behind us. This friendly encounter lasted several minutes untill we left and saw them in the rear view as we drove away. I guess we could have gotten closer at that point, but I like to leave wild animals in peace, as much as I like watching and meeting them. You have to look closely, but the chick is in the picture all right! Canon 60D, ISO 640, f/6.3, 1/125s, 270mm.